DEDICA Review 2019: Is DEDICA a Good Hosting? Founded in 2011, Dedica is a Canadian company that provides fast and reliable VPS and Dedicated servers to individuals and businesses. Their datacenters are located in Canada, Netherlands, Ukraine and France. Dedica has been providing reliable and affordable hosting solutions to its Canadian customers and international customers since 2011. With datacenters in four countries, Canada, Ukraine, Netherlands and France, Dedica offers unparalleled VPS and Dedicated server hosting services with an excellent customer support record. One of the things I was impressed with is how fast the servers took to come online. Within minutes of purchasing a package, I could already use it. The high-performance hardware, which includes SSD storage and fast uplinks connection, makes great load times for the users. This is by far one of the greatest activation times out there. The SSD drives are optional for the dedicated servers. You can trade them for a larger HDD space. Do you have your website or application hosted somewhere else? With Dedica, they provide a free website transfer. I had several sites that I needed transferred and the technical support team helped me to do quickly. The best part is that during this whole process you won’t experience much downtime. When you order a dedicated server or VPS, you will get remote access to your machine via IP-KVM. Dedica gives you complete access to a custom control panel that lets you manage the different aspects of your hosting. This can be a little intimidating at first but once you get the hang of it, it is pretty much straight forward. They also support different languages to cater for clients from different parts of the world. I would definitely say it is simple enough for the everyday guy to get around. With Dedica, you can say goodbye to long-term contracts that tie you down. They have a monthly billing cycle for all their products. They also offer competitive prices for their packages both for their VPS solutions and the dedicated server solutions. I wouldn’t worry too much about their pricing as the speed, reliability and hardware they use is quite good. Scaling up or down between the packages is easy. You may want to take advantage of their full server management service if your hands are tied. Dedica has one of the best customer support response times out there. Their team is both friendly and professional. Once you launch a support ticket or get to their live chat, you can expect help within minutes. You also have the option to send an email or call their support phone number besides sending a Facebook message. And since they fully monitor their systems, you can count on them to resolve hosting issues before they knock your website offline. 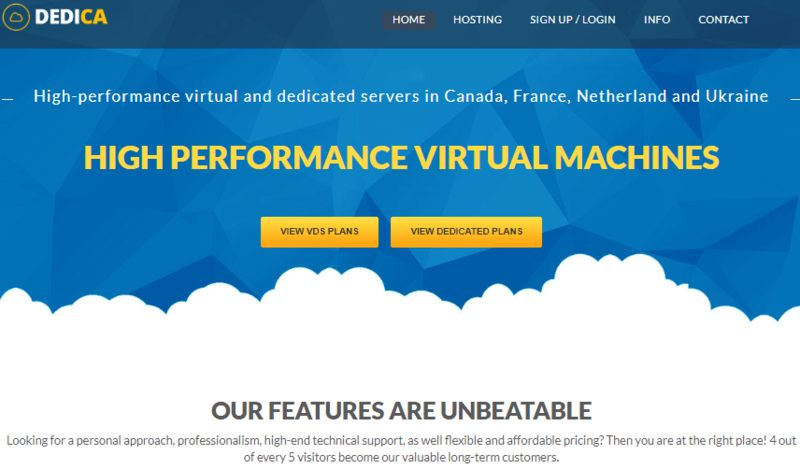 If you are looking a reliable VPS or dedicated server in Canada that is backed a professional customer support team then you should consider Dedica. They offer very competitive prices and fantastic support to their customers. Check out DEDICA’s web hosting options today! Wondering how DEDICA stacks up against other Web Hosting companies? Enter any other Web Hosting company and we will give you a side-by-side comparison.